Heli-skiing tours can only be booked online 7+ days in advance. To book your heli-skiing tour within 7 days, please call 1.800.944.7853. Why should I go heli-skiing or boarding in Whistler? Whistler is the perfect place to experience heli-skiing or heli-snowboarding. Featuring ultimate vertical, sky high views, a thrilling helicopter ride and the most adventure you can pack into a day, a heli-skiing or boarding tour will be the highlight of your trip. 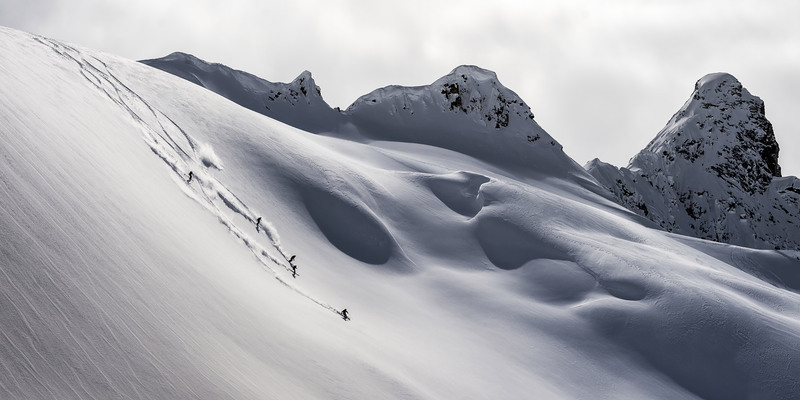 90% of heli-skiing in the world happens in British Columbia and the heli-skiing area around Whistler is more than 50 times the size of the Whistler Blackcomb ski area. The extent of the terrain means there is variety and fantastic conditions for all weather and snow types. 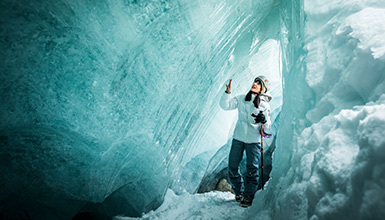 In Whistler, you can also enjoy the convenience of staying in-resort while accessing the wilderness. Choose from a wide variety of accommodation, and enjoy the dining, shopping and other winter activities on offer. How good of a skier or snowboarder do I have be to go? We will group you with other guests based on your ability level and package. If you over estimate your ability it will affect the pace of the day, terrain selection, and other guests enjoyment. Logistically it is very difficult for us to remove you from the field, have you sit out a run, or move you to a different group, so an honest analysis beforehand is critical. How are skiers and snowboarders grouped? Skiers and boarders are placed into groups of similar ability. Sometimes very early or late in the season we will have a group of varying stated ability levels. 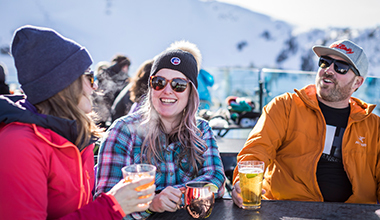 If you really want to ski with your friends, but they are of a higher ability than yourself, please give us a call and we can help you decide which package is best for you. Our staff are experienced and able to guide you in the right direction. Do you have to jump out of the helicopter? Definitely not! The helicopter lands at the tops of the heli-ski runs to allow all skiers to exit the helicopter. The guides will then unload the skis, poles, and snowboards. When is the best time to go heli-skiing in Whistler? The most popular months to heli-ski in Whistler are February and March. Snow and weather conditions are generally most reliable at this time of year. 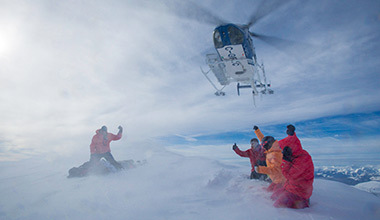 December and January often see frequent snowstorms so the heli-skiing can be outstanding. March and April see longer days and amazing spring skiing. What kind of terrain do you heli-ski on? This is weather dependent. On clear days you can expect to ski on the many glaciers in the area. If the weather does not allow us to get to the glaciers, you can expect to ski in the sub-alpine tree runs. The guides will select terrain suitable for each group's abilities, but always consider snow, weather, and avalanche conditions. Is it possible to rent powder skis or snowboards? Your heli-ski day will be a lot more fun with the right ski and snowboard equipment. Powder skis and powder snowboards are available for rent from 4:00 PM – 7:00 PM the evening prior to your ski day. Please bring your own ski poles and ski or snowboard boots. We recommend that you wear what you would normally skiing or snowboarding. Synthetic and wool layers are good options. Goggles and a warm hat or helmet are mandatory. Sunglasses (with retention straps) are best kept for springtime use. Are you the type of skier who can stay in balance when off groomed runs, in soft snow, variable snow conditions but certainly not smooth? Is your fitness where it should be for backcountry skiing, especially if there are limitations in your skiing ability that will require more effort? Are you in the right package or will you hold others back? Are you the type of snowboarder that can traverse and carry momentum across flat ground in soft snow without getting stuck? Do you have the right equipment? Is your snowboard rockered and long enough or might the nose get buried in soft snow continually because it’s a ski hill board? Can you easily link turns on a snowboard or do you end up side-slipping a lot? Can you be challenged by variable terrain given weather considerations (steeper rolls, some tree skiing etc)? Will you be able to complete all the runs in your package or will you have to abort the day impacting the value of your purchase and logistics for the entire program? Book your heli-skiing for your second ski day. This gives you the first day to warm up your legs and is early enough in your trip in case your heli-skiing day needs to be rebooked because of a inclement weather. Your heli-ski day will be a lot more fun with the right ski equipment. The heli-ski rental shops have powder skis for intermediate to expert skiers. Please bring your own ski poles and ski boots, which can easily be fitted to the rental skis. Rental rates from $50 per day. The Whistler heli-ski area is made up of several zones and is approximately 50 miles north/south by 30 miles east/west (80km by 50km). Experience skiing or riding in an area that is 50 times the size of the Whistler Blackcomb ski area! This package is only available to book by phone. 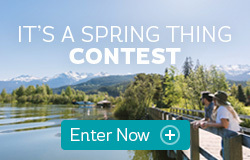 Please call 1.800.944.7853 to speak with a Whistler based Travel Consultant. Have a group of 12 or more? Contact our Group Sales Team on 1.866.299.6971 or click to email. Starting from package rate is per person, based on 2 adults sharing a 4-star hotel room or studio in December 2018. Rates are subject to availability at the time of booking and vary depending on high season/regular season. Taxes and fees are extra, restrictions may apply. Please note that all bookings are transacted in Canadian dollars. One day of Heli-Skiing not enough? Book a second day and receive $100 off plus free powder ski rentals. Call 1.800.944.7853 for more details. A bucket list is a great way to motivate yourself to do your dream activities. This list has options for all budgets and dreams. From high end accommodations to the best dining spots and unique winter experiences, we can create an extraordinary adventure for you.